It’s No Fluke…The Paramount in Huntington, New York Repeats as #5 Worldwide Club Venue for 2018! For the second consecutive year, Pollstar Magazine, a leading publication in the concert industry, ranked The Paramount, In Concert with TD, #5 in the world for Club Venues, based on year-end ticket sales. Repeating in 5th place for the second consecutive year is a major achievement for the venue! 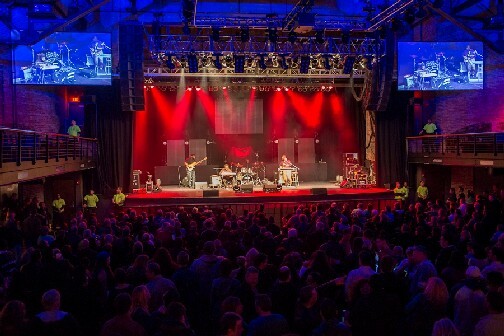 With over 178,000 tickets sold again this past year across 170+ events, Brian Doyle, co-owner of The Paramount, remarked “After 7 years, the venue has proven itself to be a top destination for the best entertainers around. We will continue to push the envelope in 2019 as we work to provide Long Islanders with the best music, funniest comedians and the most memorable live event experiences available”, he concluded. 2018 saw The Paramount sell our 1 Millionth ticket and host our 1,000th show – since opening in November 2011 – Some of the most memorable concerts in 2018 were performed by Slash, Blues Traveler, Pat Benatar & Neil Giraldo, Ratt, O.A.R., Chase Rice, Indigo Girls and Metal band Underoath – who performed at the venue on the same day they were nominated for a Grammy Award. Local Long Island entertainers such as: Sal Valentinetti, Countess LuAnn, Madison Beer, Theresa Caputo, Rosie O’Donnell and Envy on the Coast; all performed shows for their hometown fans in 2018. The Paramount also welcomed many world-famous artists for the first time to Huntington in 2018 such as; Rick Astley, Sarah McLachlan, The Struts, Bret Michaels & The Beach Boys…just to name a few. The Paramount Comedy Series reached new heights of success in 2018 by adding monthly performances of The Jim Breuer Residency and multiple nights with comedian Kevin James. The Comedy Series also featured performances by; Andrew DICE Clay, Ken Jeong, Aziz Ansari, Jim Norton, Iliza Schlesinger, Weird Al Yankovic, Tracy Morgan and more…2018 also featured the return of “The Pride of Huntington” Chris Algieri to The Paramount ring with Joe DeGuardia’s STAR Boxing, as he returned to fight at the venue where he rose to fame. In 2019, The Paramount looks forward to performances by Long Islander Chazz Palminterti, movie star Dane Cook, Dave Matthews’ guitarist Tim Reynolds, two (2) nights with Judas Priest in May and four (4) shows with comedian Jim Gaffigan later this year. With over 60 shows already on-sale for 2019, The Paramount is poised to crack the Top 5 this year. The Paramount would like to thank Long Island for supporting the venue and the hardest working staff in rock & roll.